Help celebrate the release of "The Resume Design Book" digital edition available exclusively through Amazon on Kindle devices or the Kindle app. No detail was spared in the digital development process: the digital download features high-quality digital conversions for the best reader experience possible. Resume Design Book has paid for all prizes, sales tax, and shipping. Entry requires an Amazon.com account. Amazon will ship prizes to winners. Your account information is not shared with Resume Design Book, except winners' names may be made public. Amazon is not a sponsor of this promotion. NO PURCHASE NECESSARY. Every 50th eligible entry will win, up to 50 winners. This giveaway started March 21,2016 11:57 AM PDT and ends the earlier of April 5,2016 11:59 PM PDT or when all prizes have been awarded. 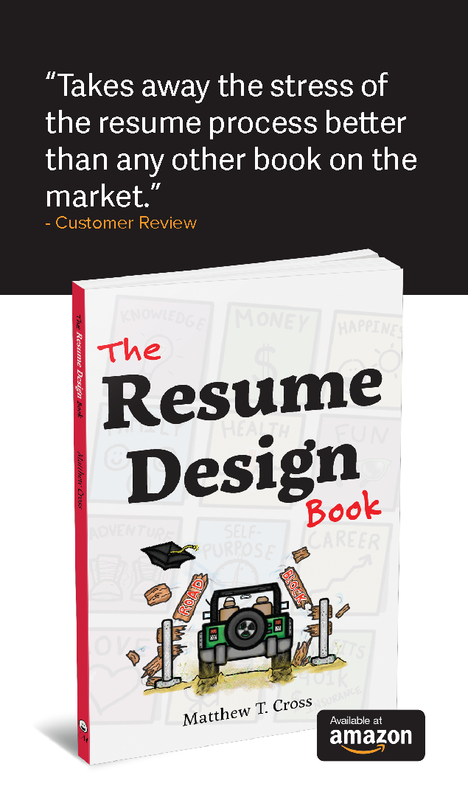 Daylight savings may make waking up difficult, but at least you can sleep soundly knowing your resume issues are solved by The Resume Design Book. Click the link below, watch the short instructional video on the 12-Minute Resume activity, and enter for a chance to win a free copy of The Resume Design Book in the "Spring Forward" March Giveaway. Matthew T. Cross has paid for all prizes, sales tax, and shipping. Entry requires an Amazon.com account. Amazon will ship prizes to winners. Your account information is not shared with Matthew T. Cross, except winners' names may be made public. Amazon is not a sponsor of this promotion. NO PURCHASE NECESSARY. Every 100th eligible entry will win, up to 20 winners. This giveaway started March 12,2016 3:01 PM PST and ends the earlier of March 19,2016 11:59 PM PDT or when all prizes have been awarded. It's resume season! It's time to start a fresh resume, or spruce up your existing one to apply for jobs in anticipation of what comes after May. Enter for a chance to win a free copy of "The Resume Design Book" in the "College Resume Season" February Giveaway. 10 Books will be given away with a 1/100 chance of winning to help college students who are short on funds or would rather spend their hard earned money on pizza and beer. The only catch is that you have to follow @resumebook on Twitter. Are your career counselors' schedules all booked up? Prepare yourself for the upcoming job-hunting season with your own personal copy of "The Resume Design Book." No purchase necessary. See complete rules on the giveaway page. Set your fantasy football lineup, sip on your pumpkin spiced late, and enter for a chance to win a free copy of "The Resume Design Book" in the Fall Giveaway. 10 Books will be given away with a 1/100 chance of winning to celebrate all the wonderful gifts that Fall brings. Prepare yourself for the upcoming job-hunting season with your own personal copy. The only catch being that you have to follow @resumebook on Twitter. To Celebrate the release of the 2nd Edition, I'm giving away 10 free paperback copies of "The Resume Design Book" though Amazon Giveaways. Every 25th entry will win a free book until all of the books have been claimed. The only catch being you have to follow @resumebook on Twitter.